As if a new iPhone wasn’t enough big Apple news for one day, the tech giant managed to top that with the announcement of its first smartwatch. The company has finally joined the latest big tech trend, unmasking its sleek Apple Watch – the “most personal product we’ve ever made”. It’s not the first wearable on the market, but Apple boss Tim Cook – who also unveiled the iPhone 6 and iPhone 6 Plus – claims it “will redefine what people expect from this category”. It is the next chapter in Apple’s story,” he told the launch in California. You can get calls, messages, notifications and emails. You’ll feel a gentle tap on the wrist when you receive a message – so no need to constantly pull out your phone. It will let you reply by dictating a message, or selecting a preset option. You can use the built-in speaker and microphone for quick chats, or transfer calls to your iPhone or in-car speakerphone. You can also send sketches and emojis, or even your heartbeat. It measures your daily activity – movement, heart rate, calories and how often you stand up – and even suggests improvements to motivate you to be healthier. It has a Workout app for cardio sessions. It also has wireless charging and apps for maps, photos and music, and can even control Apple TV. Users will be able to pay for goods by tapping the watch on a contact reader with Apple Pay – though there is no word on when this will be available in Australia. 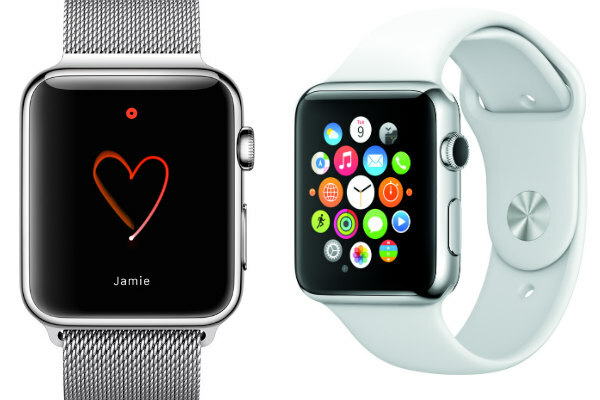 It comes in two sizes, with a smaller model for a smaller wrist. 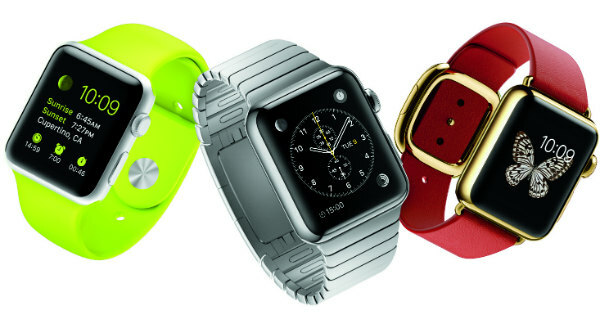 There are three different collections – Apple Watch, with stainless steel cases and sapphire crystal; Apple Watch Sport, with anodised aluminium cases in silver or space grey, strengthened glass and durable bands; and Apple Watch Edition, with 18-carat gold cases in yellow or rose, sapphire crystal and luxury bands and closures. In all there are 15 different versions. Bands range from traditional stainless steel to an attractive buckle, leather, stainless steel mesh, and rubber-like fluoroelastomer. And you can customise it by choosing from 11 faces, and make your favourite features – such as weather updates or stock prices – available in one quick swipe. It has a “digital crown” on the side that lets the wearer zoom, scroll and navigate on the device without covering the small screen (like the iPod’s clickwheel). The digital crown is also the home button and access point to Siri. It has an in-built heart rate sensor, GPS and accelerometer. Lift your hand to look at the watch, and it will automatically bring up the home screen. Its retina display can sense the difference between a tap and press, helping wearers control apps. Apple says the watch has a chip that essentially makes it a mini-computer. It has wi-fi and Bluetooth to pair with an iPhone. 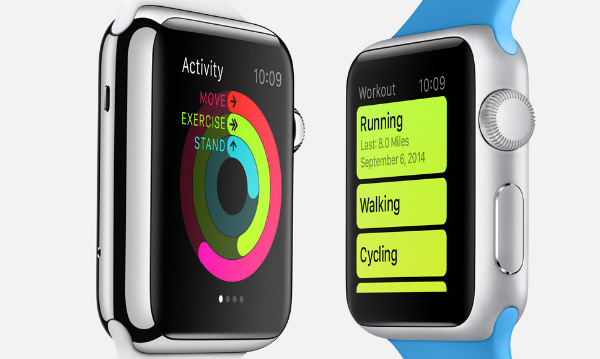 From next year, developers will be able to develop apps specifically for Apple Watch. It will be released early next year and will cost from $US349 – Australian pricing has not yet been revealed. 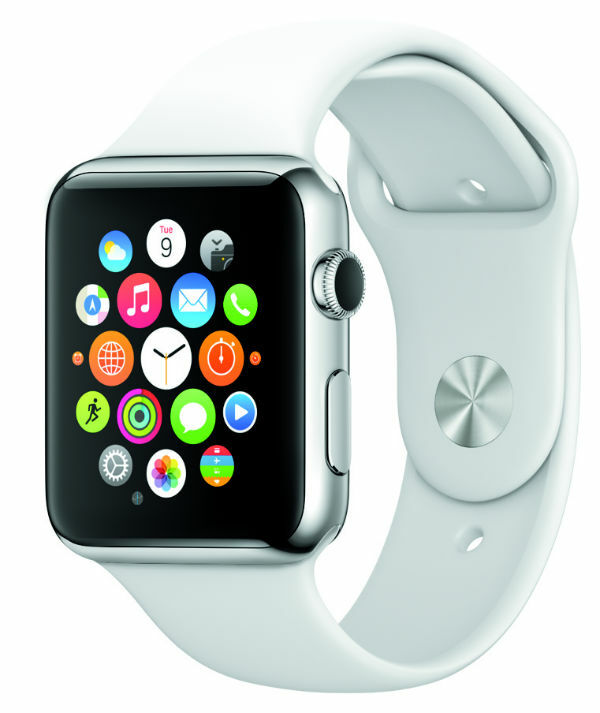 Importantly, users will also need an iPhone to make the watch work. What do you think – worth the hype? Tell us below.